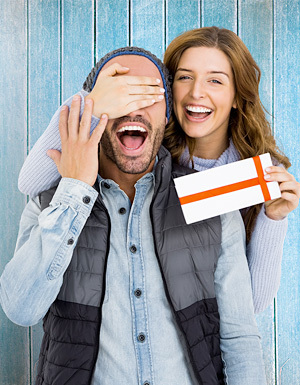 Whether you are looking for the perfect gift for a loved one, or a creative way to award your employees, Southwest Vacations package gift cards are great for any occasion. With our low prices and fabulous destinations, a vacation package gift card goes a long way toward a dream vacation. Southwest Vacations package gift cards are only redeemable at www.southwestvacations.com, by calling 1-800-243-8372, or via a travel agent. Southwest Vacations package gift cards are not valid for Southwest air fare only purchases. View the full Southwest Vacations package gift cards terms and conditions. Please allow 7 – 10 business days for order processing with standard delivery and 2 – 5 business days for order processing with priority delivery. If paying by credit card, purchaser's name and address must be the same as the billing address for the credit card used for the purchase. Gift Cards are nonrefundable and not redeemable for cash or credit except where required by federal or applicable state law. Gift Cards have no expiration date, are not a credit/debit card, and have no implied warranties. Gift Cards are not replaceable if lost, stolen, or destroyed. Activation or use of a Southwest Vacations package gift card constitutes acceptance of all terms and conditions. Use of gift cards for advertising or promotional purposes (including but not limited to sweepstakes) is strictly prohibited without the prior written consent of Southwest Vacations. Indicate the gift card amount, in whole dollars, and quantity of cards. The minimum value allowed per card is $25. The maximum value allowed per card is $2,000. The maximum value allowed per order is $10,000. Focus will move to the amount field for the new gift card. Focus will move to the amount field for the first gift card. Indicate personalized text below to be printed on the card holder. NOTE: multiple cards order will have the same personalized text printed on each card holder. If the fields are left blank, nothing will be printed on the card holder. A gift to: Indicate what you would like to appear in the "To:" line of the gift card holder. A gift from: Indicate what you would like to appear in the "From:" line of the gift card holder. Indicate the personal message that you would like to include with the gift card. NOTE: multiple cards order will only be shipped with the USPS Priority mailing option. Please enter the address where the gift cards will be delivered. Country* United StatesWhy can't I change? Delivery service is available within the US only. The security code is the last 3-digits printed on the back of your card for most credit card types. For American Express cards, the security code is the 4-digits printed above your account number on the front of your card. A Southwest Vacations package gift card is only valid on vacation packages or activities purchased through Southwest Vacations. Southwest Vacations package gift cards may only be redeemed at www.southwestvacations.com, by calling Southwest Vacations at 1-800-243-8372, or via a travel agent. To redeem online: Visit www.southwestvacations.com and price your package as you normally would. On the payment page, select the gift card payment option and complete the required information. To redeem by phone or via a travel agent: Inform the customer care specialist or travel agent that you are redeeming a vacation package gift card and provide the requested information. See Southwest Vacations package gift card terms and conditions for full redemption information and restrictions. Check your Southwest Vacations package gift card balance below or call 1-877-729-1815. For assistance with buying or redeeming a Southwest Vacations package gift card, call 1-800-243-8372.